A close look at two classic blue-chip stocks. At first glance it may seem odd to compare International Business Machines (NYSE:IBM) and McDonald's (NYSE:MCD), as one company is a legacy tech giant and the other is the world's largest fast-food chain. Beyond the obvious differences, however, the two companies have a number of similarities as stocks. They are both blue-chip members of the Dow Jones Industrial Average, and they've both been around for generations. McDonald's dates back to 1940, while IBM was founded in 1911. The two stocks also check many of the same boxes for investors, as they are both reliable dividend payers -- though only McDonald's is a Dividend Aristocrat, meaning it's raised its dividend every year for 25 years in a row. IBM, however, is only a few years away from achieving that status. As stocks, both are down modestly this year, though McDonald's has been the clear winner over the last five years, as the chart below shows. Let's take a look at what each stock has to offer today and go over the key numbers that investors should be aware of. For years McDonald's seemed to be falling behind fast-casual rivals like Chipotle Mexican Grill as U.S. comparable sales fell and profits and share price stayed flat. However, that changed with the entrance of CEO Steve Easterbrook, who has revived the brand domestically with the help of initiatives like all-day breakfast and using fresh beef in quarter pounders. The company has also been embracing more natural food trends: It's eliminated antibiotics from its chicken, and pledged to only use cage-free eggs. Overseas, Easterbrook has unlocked profits by refranchising restaurants. Though McDonald's stock has been flat this year, the Golden Arches' performance still looks solid. In its most recent quarter, comparable sales increased 4% with comps up in all segments, the 12th quarter in a row comparable sales have risen. Adjusted earnings per share grew 15% in the quarter to $1.99 and EPS has been boosted by the company's refranchising initiative, which has allowed it to increase share repurchases. Looking ahead, McDonald's sees steady growth: The company forecasting long-term, annual EPS growth in the high-single digits, 3-5% annual systemwide sales growth, and operating margin in the mid-40% range, which has been boosted by selling off company-owned stores to franchisees. If McDonald's can deliver on that guidance the stock should generate reliable returns for investors. In its heyday in the 1980s, IBM was the most valuable company in the U.S., but the tech giant that has long been known as Big Blue has been in the midst of a long transformation, jettisoning traditional hardware segments and instead focusing on services like the cloud and artificial intelligence with its Watson supercomputer. As a result of that strategy, IBM's revenue declined for 22 straight quarters, a streak that finally came to an end earlier this year. Along the way, Warren Buffett, who had once been a big backer of the tech giant, bailed out of the stock, acknowledging that he misread the company's growth potential. Due to that strategy and a penchant for share buybacks, IBM is a mere shadow of its former self -- its market cap has fallen by nearly half since 2013 to $128 billion. While IBM's era of shrinking revenue is over, its top line is barely growing these days. In its most recent quarter revenue increased 2% on a currency-adjusted basis to $20 billion and adjusted earnings per share ticked up 5% to $3.08, though without share buybacks that increase would have just been 3%. IBM appears to be executing on its strategic goals: Cloud revenue is up 23% over the last four quarters, and revenue from its "strategic imperatives" has increased 15% to $39 billion during that time. But that hasn't been enough to turn around the company as a whole. Gross margin, for example, is down from 45.2% to 44.6% through the first half of the year, and management's guidance calls for adjusted EPS of at least $13.80, barely higher than last year's $13.66. Considering those results, it's not a surprise the stock has continued to languish. 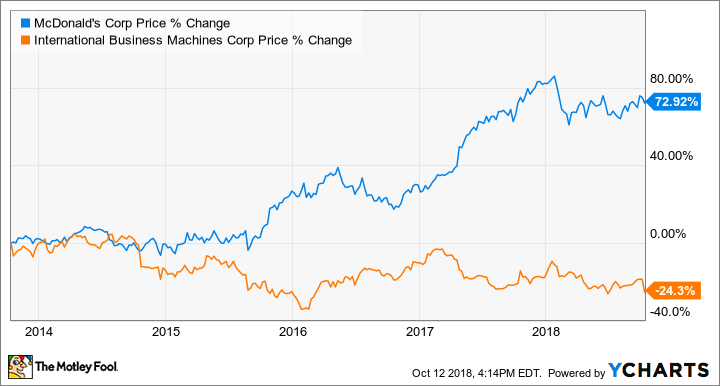 For a complete comparison between IBM and McDonald's, it's not enough to just look at past performance, current position, and future expectations. We have to consider valuation and dividends. Here it seems that IBM is the winner. The tech stock trades at a P/E ratio of just 10.1, a reflection of its stagnant growth, while McDonald's is valued at 22.6, more in line with the market average. As a dividend payer IBM also looks like the better choice, as it offers a dividend yield of 4.2% against McDonald's dividend of 2.8%. IBM has also generally grown its payout faster in recent years and has a lower payout ratio compared to McDonald's, due in part to its lower valuation. Still, despite IBM's advantage in terms of both valuation and its dividend, McDonald's looks like the better buy here. The fast-food giant has a much better grip on its future, as it has successfully adapted to regain its role as the leader of the fast food industry. IBM, on the other hand, looks like it's playing catch-up to Amazon and others in the cloud, and its pivot to services has yet to pay off. For investors looking for a reliable blue-chip stock, McDonald's is the better choice here.